Killing terrorist leaders: It’s not a winning strategy. Does Killing Terrorist Leaders Work? 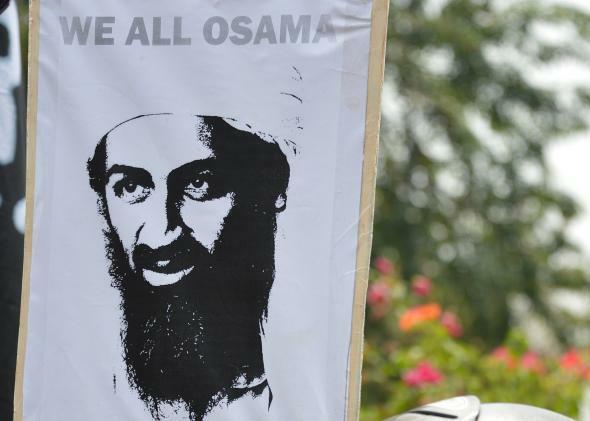 A protester holds up a placard showing late terrorist leader Osama bin Laden during a demonstration marking the anniversary of the 9/11 attacks in Jakarta on Sept. 11, 2012. The Washington Post reports that U.S. officials are now saying that the CIA didn’t know in advance that its drone strike in Yemen last week was aimed at al-Qaida in the Arabian Peninsula leader Nasser al-Wuhayshi. Rather, the attack that killed Wuhayshi was a “signature strike,” the controversial tactic in which airstrikes are ordered based on a “pattern of life” analysis, which in this case suggested the presence of terrorist leaders rather than knowledge of a specific one in place. The Obama administration had suggested it was phasing out the practice of these attacks in 2013, but they’ve continued, making news in January when an American and an Italian al-Qaida hostage were killed in a signature strike in Pakistan. Nonetheless, the White House is touting the lucky break—which comes after a series of successful targeted killings including one that killed the al-Qaida-affiliated militant Mokhtar Belmokhtar in Libya last weekend—as evidence of progress in the fight against al-Qaida. (The less said about progress against al-Qaida’s rival ISIS right now, the better.) Though derided by critics as “whack-a-mole,” the administration argues that targeting senior al-Qaida leaders with drone strikes, and occasional special operations capture missions, severely disrupts the group’s ability to operate. It’s hard to remember now, but the U.S. was once against the practice of assassinating terrorist leaders. Even the Bush administration, in its early days, criticized Israel’s targeted killings program. Since then, partly due to improvements in drone technology and the withdrawal of most U.S. troops from Iraq and Afghanistan, killing senior terrorist leaders has become America’s go-to counterterrorism method. But, legal and ethical questions aside, counterterrorism researchers have been skeptical about its effectiveness. Assassination can turn charismatic terrorist leaders into martyrs, cause resentment in potential supporters—particularly if the attack also results in civilian casualties—and terrorist organizations are often impressively resilient. Georgetown’s Daniel Byman has argued that Israel’s targeted killing program prompted Hamas to decentralize its leadership structure, actually increasing the number of its attacks. Jenna Jordan, now a professor at Georgia Tech, has examined hundreds of examples of “leadership decapitation,” finding little evidence to suggest that it makes groups more likely to fall apart or stop carrying out attacks. The frequently cited examples of terrorist groups that either collapsed or were severely impeded after their leaders were captured or killed—the Peruvian guerilla group Shining Path’s Abimail Guzman, who was captured in 1992; the Kurdish PKK’s Abdullah Ocalan, who was arrested in 1999; and Palestinian Islamic Jihad’s Fathi Shaqaqi, who was killed by the Mossad in 1995— tend to be from before 9/11. Since then, the record is less clear. The killing of Osama Bin Laden and many of his top lieutenants has clearly decimated the group’s global leadership, but starfish-like it has sprouted decentralized appendages in Yemen, North Africa, and Syria. The U.S. killed al-Qaida in Iraq’s charismatic leader Abu Musab al-Zarqawi in 2006, but the group he led has morphed into what we now called ISIS. The U.S. just killed Wuhayshi last week, but AQAP has already replaced him with another senior member of the group. And while ISIS leader Abu Bakr al-Baghdadi would be difficult to replace, there’s little reason to think the organization he built would collapse without him. There are evidence-based arguments in favor of targeted killings: Patrick Johnston of the Rand Corp. found in a 2012 study that conflicts often end more quickly when insurgent leaders are killed—but even he conceded that targeted killing is “usually not a silver bullet” and should be used only in conjunction with other strategies. Too bad a silver bullet is exactly what the U.S. is counting on in countries like Iraq, Syria, Libya, and Yemen, where a lack of reliable partners on the ground make other strategies impossible. President Obama once touted his administration’s cooperation with the Yemeni government as a counterterrorism model, but since that government’s collapse, death from above is seen as the best available tool for countering al-Qaida. Considering the civilian casualties, local backlash, and dubious legality, it would at least be nice to think these attacks were accomplishing something. At the moment, it’s not clear that they do.